A sidebar will appear on the right of your document, and if you are at a point in your document where some pinyin with tone numbers is detected you’ll see it being converted as below, (otherwise the text is copied over as is). Conversion is carried out in real time, as you type. You’ll see that the sidebar is split into a number of panels, each of which can be shown or hidden by clicking on the Show/Hide text on the blue panel separators.. The starting panel shown is the ‘Tone number to mark’ panel, which is the main function of this add-on. The direction of conversion can be chosen by the ‘Convert tones’ radio button. 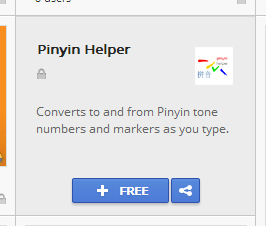 To try , move the document cursor to some pinyin with tone numbers, or simply type some in. You’ll notice that the contents of the panel will contain the the converted pinyin. If no pinyin with numbers is found, the current block of text is displayed as is. To try out, move the document cursor to some pinyin with marks. You’ll notice that the contents of the panel will contain the the converted pinyin. If no pinyin with marks is found the current block of text is displayed as is. 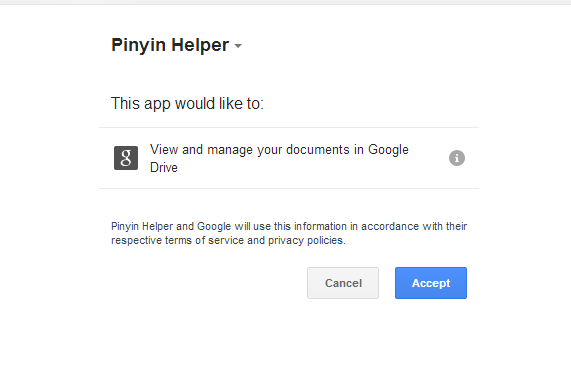 You can replace the pinyin in your document with that shown in the panel by using the replace button. The helper operates on the whole element that the cursor is currently on (the whole paragraph, list item, table cell and so on) by default. You can also convert a selected area simply by selecting the text in the document. For example, below I’ve selected an entire column of a table. The conversion is shown in the sidebar. The replace button will do all the selected elements at once.